A man was sent to prison after he pleaded guilty to attacking a Champaign County sheriff deputy Wednesday in the Champaign County Common Pleas Court. Christopher G. Blanton, 38, was sentenced to three years in prison after pleading guilty to one count of attempted felonious assault, a third-degree felony. On April 22, 2018, Blanton struck a deputy in the head with handcuffs affixed to him while deputies attempted to arrest him on East Dallas Road. Blanton had fled on foot and holed up in a nearby residence, causing a standoff that involved a full law enforcement response. Deputies had responded to the 100 block of East Dallas Road on that date, following up on a complaint filed the previous day. Upon their arrival, deputies observed Blanton flee the area on foot. Deputies learned Blanton was associated with the residence of 174 E. Dallas Road. According to information from the sheriff’s office, residents at that address are his relatives and had been harboring Blanton – a known fugitive – while he worked on their vehicles. While walking to the field north of the Dallas Road residences, deputies observed Blanton exit from underneath a camper at 154 E. Dallas Road. Blanton once again fled the area and deputies continued checking for him due to his suspicious behavior. Deputies observed one of the camper doors was unlatched and obtained consent from the property owner to check inside the camper. Upon entering the camper, deputies located and detained Blanton. When asked for identification by deputies, Blanton refused to provide it. A patrol vehicle was driven to the camper location and deputies began to check Blanton for weapons. 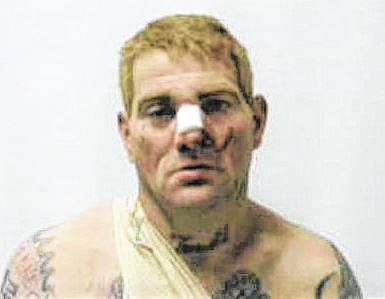 Blanton struck a deputy over the head with the handcuffs affixed to him. Blanton then fled again on foot and deputies pursued him toward the 174 E. Dallas Road residence, tasing him twice. Blanton pulled the taser probes from his body and retreated into the residence where he had been harbored. The occupants of the residence informed deputies that Blanton had acquired a handgun and was inside, causing a standoff to ensue. After an extended period of time, Blanton was apprehended and taken into custody. Previously, Blanton’s case was scheduled to go to trial starting on Jan. 29. As part of his plea, charges of aggravated possession of drugs and obstructing official business were dismissed. Upon his release, Blanton is subject to post-release control for three years.